In the early months, babies generally sleep for about six straight hours through the night. However, by the end of the first year, most babies will sleep for 10-12 hours at night. 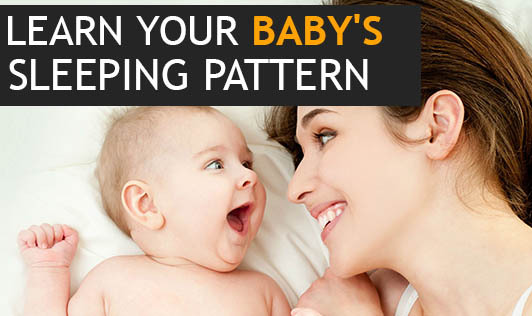 You can start by regulating your baby's sleep patterns and teaching them good sleep habits at an early time. Unfortunately, in the early, newborn days, you really can't do anything to control a baby's sleep pattern. 1.Separate sleep from being merely sleepy: During infancy, the baby sleeps as and when he/she wants. Don't allow the kid to sleep for the sake of sleeping. Try socializing and distract him with other activities. At night, before he goes to bed, start to create bedtime routines - playing quietly, reading, including a massage, taking a warm bath, changing into pajamas, singing or darkening the room. This will help your baby anticipate the end of the day and make a smooth transition from wakefulness to sleep. 2.Treat night-time meals different from daytime ones: During the day, the meal pattern can be different. The day-time meal can be fed with activities like talking, singing and by interacting with your baby. At night, change the environment. You can make your baby eat something different and let the environment be silent when you are feeding at night. 3.Encourage an older baby to fall asleep on his own: At first, your baby will undoubtedly fall asleep in your arms while feeding or being rocked. He may sleep if you carry him in a sling, where the natural rhythm of your walk and your warmth lull him. But eventually, you want your baby to get used to the idea of going to sleep on his own. Introduce the notion gradually. When your baby is drowsy, but not yet asleep, lay him down. By putting him down when he's awake - but still feeling loved and cozy - he may associate falling asleep himself with such feelings. However, this may be easier said than done. But do continue to try to put your baby down sleepy, but awake, and soon he'll get the hang of it.